Episodes of the Film Festival Secrets podcast. 1 of MovieMaker Magazine's "Five Essential Podcasts to Augment Your Ongoing Movie Education"
1 of Indie Film Academy's "Top 25 Best Filmmaking Podcasts"
The easiest way to listen to the archives and get new episodes as they appear is to subscribe to the feed in iTunes or your favorite podcast client. In this episode I talk to Brad Wilke, an award-winning filmmaker, produced feature-length screenwriter, and film programmer for the Seattle International Film Festival. Veteran filmmaker, teacher, and fundraiser Mark Stolaroff takes a pause in the middle of the Kickstarter campaign for his new film “DriverX” to reflect on his filmmaking career and the psychology of asking friends and strangers for money. Mark is the creator of the "No Budget Film School” seminars and a role model to many indie filmmakers. Film Festival Secrets Podcast #35: It's a Trap! "Festival rights" & the music in your film. Are you being offered the “festival rights” to the music in your film at a discount? It’s a trap! Find out why the deal you’re being offered might not be the best option for you. Jen West and James Martin are partners in life, partners in filmmaking (they alternate between directing and producing on each film), and partners in a string of successful crowdfunding projects. Now they face a new challenge -- distributing their most recent completed film online and on the festival circuit while raising funds for their first feature-length film. Excerpted from their online course “Film Festival Hacks,” Alex Ferrari (Indie Film Hustle) and host Chris Holland talk about the career building and networking opportunities to be found at film festivals. Film Festival Secrets Podcast #32: What Should I Look for on a Film Festival's Website? Chris Holland talks about the legwork of creating a festival strategy, in particular the research you should be doing about the festivals you think you want to submit to. After several hours of recording lectures for our new online course (more details in the show), filmmaker Alex Ferrari and I had a more casual conversation about his personal experience with festivals around the country and in industry towns like Los Angeles. Sometimes filmmakers face the classic "bird in the hand" problem. Case in point: my friend Amy's short film "Pickle" was accepted by one festival, but her "dream date" festival is still on the fence. That's a problem, because showing at the first festival to extend an offer might lessen the dream festival's interest. Should she go ahead with the sure thing, or wait for her dream festival to make up its mind? This episode I'm joined by Richard Gale, creator of the short film "The Horribly Slow Murderer with the Extremely Inefficient Weapon," which is on its way to becoming a feature film thanks to a healthy festival run and a rabid YouTube fan base. Learn how Gale turned festival success into a cottage industry and a budget for a feature-length horror comedy. Film Festival Secrets Podcast #28 - How can I pick the right festivals for my film? One of the most frequent questions I get from filmmakers is: how can I narrow the field of thousands of film fests to pick the right festivals for my film? 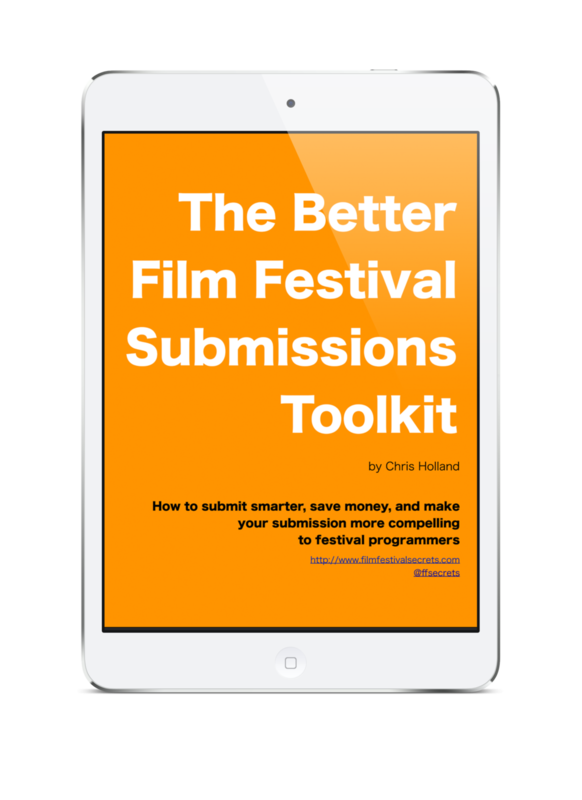 This short podcast covers some basic steps to help you winnow those large lists down in a hurry by examining your film before you examine the festivals. This episode is just a quick message from me to the listeners and the backers of the campaign about the progress thus far and where it's going to go from here. My guests on today's show are Bodine and Alexis Boding, the husband and wife filmmaking team responsible for one of my favorite films of the last year, Movement and Location. The film features time-traveling refugees who have fled to their past -- our present -- to escape the harsh conditions of the future. To see older episodes, visit the podcast feed in iTunes or your favorite podcatcher.